Puccinia striiformis Westend. is an obligate biotrophic parasite that could infect wheat and grasses to cause stripe rusts. P. striiformis, a species of rust fungi, is divided into several formae speciales based on host specialization, including P. striiformis f. sp. tritici, P. striiformis f. sp. hordei, P. striiformis f. sp. elymi, P. striiformis f. sp. agropyri, and P. striiformis f. sp. secalis. Among the five forms of P. striiformis, sexual stage was confirmed only for the wheat form of the rust, P. striiformis f. sp. tritici, but not known for the rest four forms. In the present study, we investigated the host specialization of three forms of P. striiformis including P. striiformis f. sp. agropyri, P. striiformis f. sp. elymi, and P. striiformis f. sp. 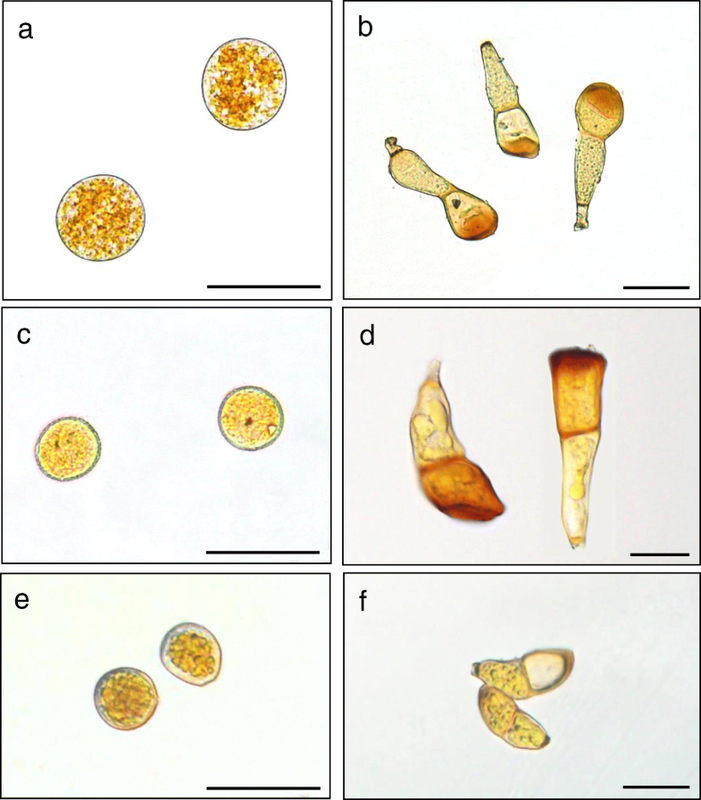 hordei, compared the morphology of their urediniospores and teliospores, and analyzed the molecular phylogenic tree of the three forms of P. striiformis and other related species in the genus Puccinia. Each of the three forms was able to infect barberry to complete pycnial and aecial stages under artificial inoculation. Further inoculations of grass, barley cv. Guoluo and wheat cv. Mingxian 169, highly susceptible to P. striiformis f. sp. tritici, using the resultant aeciospores showed that the aeciospores could successfully infect their respective hosts and produce uredinia with high infection types, with the exception on wheat cv. Mingxian 169 where only necrosis was observed. The results suggested that Berberis spp. were alternate hosts for the three formae speciales of P. striiformis, and confirmed that the three rusts were macrocyclic and heteroecious rust fungi completing the whole life cycle on primary hosts and alternate hosts. Our study provides a basis for studying pathogenic variation of the rust fungi through sexual hybridization between formae speciales of P. striiformis. Shujie Huang and Shuxia Zuo contributed equally to this work as co-first authors. The online version of this article ( https://doi.org/10.1186/s42483-019-0021-y) contains supplementary material, which is available to authorized users. Stripe (yellow) rust, caused by Puccinia striiformis Westend., is a common fungal disease damaging cereal crops and gramineous grasses (Liu and Hambleton 2010). The disease is spread by air-borne urediniospores for hundreds to thousands kilometers (Zadoks 1961; Brown and Hovmøller 2002; Hovmøller et al. 2002). Huge yield losses of crops resulted from epidemics of stripe rust often occurred in temperate areas where the summer is cool and the moisture is adequate for dew formation (Rapilly 1979; Li and Shang 1989; Zadoks and van den Bosch 1994). Wheat stripe rust is an important wheat disease in many countries, especially in China (Wan et al. 2007), the United States (Chen 2005), and some new stripe rust-invaded territories including Australia (Murray et al. 1994; Wellings 2007), New Zealand (Beresford 1982), and South Africa (Boshoff et al. 2002). Stripe rust epidemics are often caused by new virulent races of P. striiformis. In China, seven displacements of major wheat cultivars nationwide have happened since 1950 because of continuous emergence of new races (Wan et al. 2007). Recently, a few of new highly virulent races, V26 virulent to Yr24 (=Yr26 + YrCH42) (Liu et al. 2010), G22–9 virulent to Guinong 22 (Yr10), Chuanmai 42 (YrCH42), 93R137 (Yr26) and Moro (Yr10) (Jia et al. 2012), and avrYr10/24/26/ch42 virulent to Yr10, Yr24, Yr26 and YrCH42 (Kuang et al. 2013), have been identified and found to evolve continuously to produce more new races. The new races caused ‘break down’ of the resistance of major wheat cultivars possessing the specific Yr genes. However, lack of sexual stage has made it difficult to study virulence variation of the rust fungi. Grasses and cereals harbor a massive of rust fungi, containing more than 380 species in genera of Puccinia and Uromyces, but only some of them are heteroecious (Cummins 1971). Most of the rust fungi do not have known alternate hosts for sexual reproduction. P. striiformis is a complex group of rust fungi and was first reported to have five formae speciales, namely P. striiformis f. sp. tritici (on wheat), P. striiformis f. sp. hordei (on barley), P. striiformis f. sp. agropyri (on Agropyron spp. ), P. striiformis f. sp. elymi (on Elymus spp.) and P. striiformis f. sp. secalis (on rye), based on host specialization by Eriksson and Henning (1894). Subsequently, other scientists reported four different formae speciales, including P. striiformis f. sp. dactylidis on orchard grass (Manners 1960; Tollenaa 1967), P. striiformis f. sp. poae on Kentucky bluegrass (Tollenaa 1967), P. striiformis f. sp. leymi on Leymus secalinus (Niu et al. 1991), and P. striiformis f. sp. pseudo-hordei on wild barley grass (Hordeum spp.) (Wellings et al. 2000). In recent years, based on combined methods of spore morphology and sequences of internal transcribed spacer (ITS) and beta-tubulin DNA regions, the stripe rust fungi infecting bluegrass and orchard grass were renamed as P. pseudostriiformis M. Abbasi, Hedjaroude, and M. Scholle, and P. striiformoides M. Abbasi, Hedjaroude, and M. Scholle, respectively (Abbasi et al. 2004; Liu and Hambleton 2010). Liu and Hambleton (2010) suggested that the P. striiformis on grass species in genera of Aegilops, Elymus, Hordeum, and Triticum, should be recognized as P. striiformis sensu stricto. Until recently, alternate hosts for P. striiformis f. sp. tritici causing wheat stripe rust and for P. pseudostriiformis (syn. P. striiformis f. sp. poae) on Poa pratensis has been reported (Jin et al. 2010), but the alternate hosts for other forms of P. striiformis have not been known. Therefore, the objective of the present study is to test whether barberry can serve as aecial hosts for the three forms of P. striiformis, P. striiformis f. sp. agropyri (Psa), P. striiformis f. sp. elymi (Pse) and P. striiformis f. sp. hordei (Psh). Fifteen days post inoculation (dpi) of the single uredinium-derived isolates of the three P. striiformis formae speciales on their respective original hosts, heavy sporulation was observed on A. cristatum (Fig. 1a), E. cylindricus (Fig. 1b), and barley cv. Guoluo (Fig. 1c), but not on wheat cv. Mingxian 169. Instead, necrosis lesions were produced on leaves of Mingxian 169 (Fig. 1d, e and f). Therefore, the three stripe rust pathogens infecting A. cristatum, E. cylindricus, and barley cv. Guoluo were determined to be P. striiformis f. sp. agropyri, P. striiformis f. sp. elymi, and P. striiformis f. sp. hordei, respectively. Subsequently, the three rust forms produced telia about 25 dpi (Fig. 1g, h and i). To further characterize the three forms of P. striiformis, morphology of their urediniospores and teliospores were assessed under a light microscope. Urediniospores of P. striiformis f. sp. agropyri on A. cristatum were near round in shape, single-celled, light orange in color, 23–34 × 21–30 μm (mean 28 × 24 μm) in size (Fig. 2a). Teliospores were two-celled, single-celled occasionally, without or with a short stalk. The apical cell of teliospores was domed or inclined, 17–32 × 15–28 μm (mean 26 × 21 μm). The lower cells of teliospores were 21–37 × 12–21 μm (mean 27 × 16 μm). Teliospore stalks were (0-) 1–6 (− 18) μm (mean 4 μm in length). The upper cells were brown, and darker than the lower cells (Fig. 2b). Urediniospores of P. striiformis f. sp. elymi on E. cylindricus were fresh orange-colored, single-celled, near round or occasionally oblong in shape, 21–29 × 19–26 μm (mean 24 × 22 μm) in size (Fig. 2c). The apical cells of teliospores were dark brown, flat or inclined, 19–32 × 14–19 μm (mean 23 × 17 μm) in size. The lower cells of teliospores were 21–32 × 9–16 μm (mean 28 × 11 μm). Teliospore stalks were (0-) 0.3–0.7 (1.3) μm long (Fig. 2d). Urediniospores of P. striiformis f. sp. hordei on barley cv. Guoluo were light orange, single-celled, near round in shape, and were averaged 26 μm in diameter (Fig. 2e). Teliospores were light orange in color, two-celled, with a short stalk or without a stalk. The apical cells of teliospores were 27–30 × 23–30 μm (mean 29 × 24 μm) in size. The lower cells of teliospores were 23–30 × 21–25 μm (mean 26 × 23 μm). Teliospore stalks were (0-) 2.3–4.5 (7.3) μm long (Fig. 2f). Alignment of ITS sequence of Agropyron form and Elymus form of P. striiformis as well as P. striiformis f. sp. 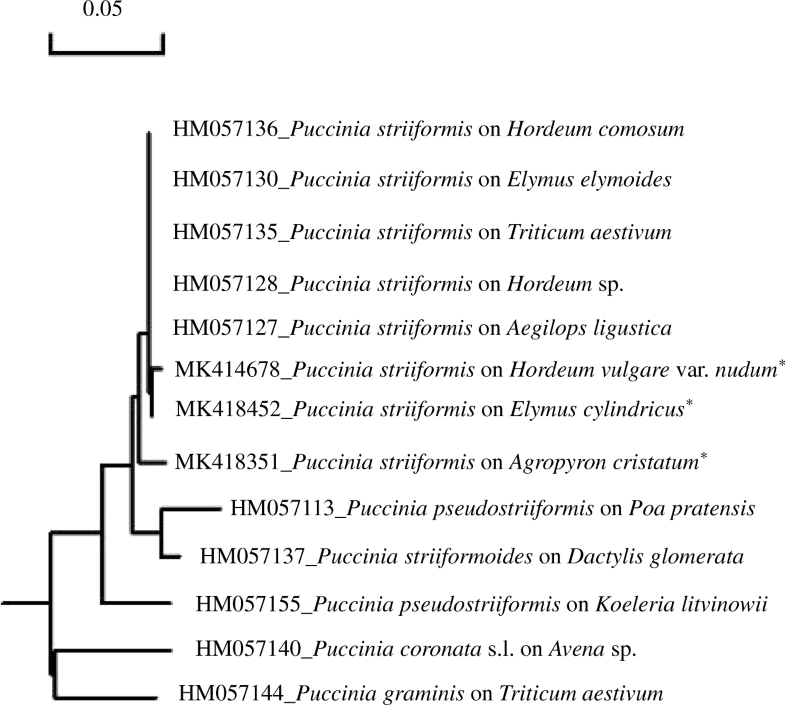 tritici showed that they shared a high sequence similarity of 97.31% (Additional file 1: Figure S1), indicating that Agropyron form and Elymus form of rust fungi used in this study were P. striiformis. Agropyron form and Elymus form of P. striiformis presented a similarity of 95.05% and displayed obvious sequence difference in internal transcribed spacer region based on sequence alignment (Additional file 2: Figure S2). 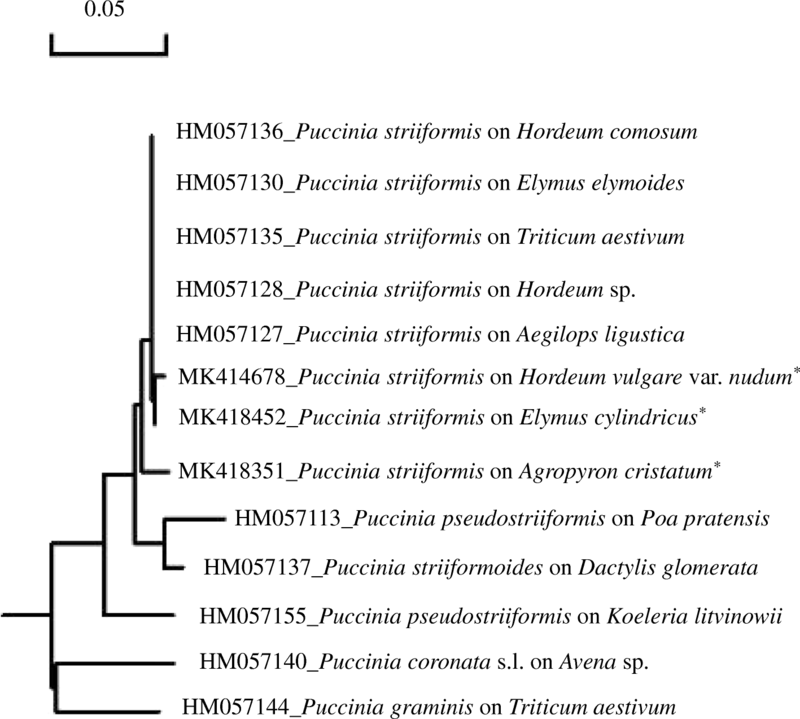 Phylogenic tree of the three forms of Puccinia striiformis used in this study, namely Psa (GenBank accession No. : MK418351), Pse (GenBank accession No. :MK418452), and Psh (GenBank accession No. :MK414678) and reference Puccinia species submitted in NCBI database (Table 1) indicated that Psh, Pse and Psa were grouped into one subclade with reference Puccinia striiformis formae speciales, including P. striiformis f. sp. hordei on Hordeum, P. striiformis f. sp. elymi on Elymus, P. striiformis f. sp. tritici on Triticum, and P. striiformis f. sp. agropyri on Aegilops, but distinguished from P. pseudostriiformis, P. striiformoides, P. coronata s. l., and P. graminis (Fig. 3). The sequence analysis, together with host specialization, showed that the three forms of P. striiformis used in the present study were P. striiformis f. sp. hordei, P. striiformis f. sp. elymi, and P. striiformis f. sp. agropyri, respectively. Seven to nine dpi, initial symptoms of tiny, light yellow lesions were visible at the early stage of the Pst infection on barberry leaves (B. shensiana). With the development of pycnia, lesions developed radially around the primary infection sites, showing dark yellow color in the centers of lesions (Fig. 4a, b and c). Simultaneously, massive pycniospores were produced inside a pycnium and moved upward to accumulate around the pycnial ostiole on the surface of barberry leaves, forming a transparent, oval drop of nectar. Nectars appeared yellow with a yellow background. After fertilization (spermatization), 13 to 16 dpi, orange, finger-shaped aecia emerged from the back side of a pycnial lesion (Fig. 4d, e and f), extending to several millimeters in length, generally 1 to 3 mm. The number of aecial cups (aecia) differed from one lesion to another. Aeciospores of three formae speciales of P. striiformis produced on barberry were used to inoculate their respective hosts, A. cristatum, E. cylindricus, barley cv. Guoluo, as well as wheat cv. Mingxian 169. Eighteen days after aeciospore inoculation, yellow uredinia were produced on leaves of A. cristatum, E. cylindricus, and barley cv. Guoluo (Fig. 4g, h and i), but not on leaves of wheat cv. Mingxian 169 on which only necroses were observed (Fig. 4j, k and l). Massive uredinia lined in arrays between leaf veins of the two grasses, A. cristatum and E. cylindricus, showing typical symptoms of stripe rust. The P. striiformis f. sp. hordei uredinia were scattered on leaves of barley cv. Guoluo seedlings probably due to the lack of vein tissues. Thus, these three forms were able to infect barberry and the resulted aeciospores could infect the grass hosts from which they were collected and produce uredinia but not on other plants tested. Puccinia striiformis frequently produces variants. Rust fungi from wild grasses could possibly harbor higher genetic variation than those from crops because of the selection on crop host. Cheng et al. 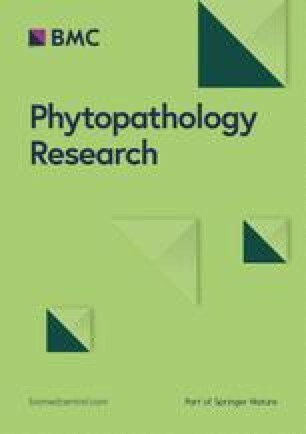 (2016) reported that grasses harbor more diverse pathotypes of P. striiformis than cereals based on pathogenicity and DNA polymorphism of urediniospore isolates collected from wheat, barley, rye, grasses, and triticale in the United States. Our study of the alternate host for the three forms of P. striiformis has led us to hypothesize that sexual genetic recombination may contribute to diversity of this stripe rust pathogen. Up to now, only the tritici form of P. striiformis has been verified to produce new variants through sexual reproduction (Tian et al. 2016; Wang et al. 2018). Other forms of P. striiformis have not been reported with the exception of P. striiformis f. sp. poae, which is now considered as a different species, P. pseudostriiformis (Abbasi et al. 2004; Liu and Hambleton 2010). In the present study, based on artificial inoculation and host specialization tests, we identified barberry (B. shensiana) as a potential alternate host for f. sp. elymi, f. sp. agropyri, and f. sp. hordei of P. striiformis. Simultaneously, another barberry species, B. aggregata Schneid., native to China and collected from Tianshui of Gansu Province was used to test the susceptibility to the three formae speciales of P. striiformis. The results indicated that basidiospores of each of the three forms could also successfully infect B. aggregata and complete the pycnial and aecial stages. All the information suggested that, similar to P. striiformis f. sp. tritici and P. pseudostriiformis (syn. P. striiformis f. sp. poae), the three forms of P. striiformis are heteroecious, macrocyclic rust fungi. The determination of sexual stage of the three forms of P. striiformis facilitates studies on virulence variation through hybridization between different forms. Previous studies showed that hybridization of different formae speciales of P. graminis can result in new races of P. graminis f. sp. tritici, the causal agent of wheat stem rust (Stakman et al. 1930). Johnson et al. (1932) made crosses of formae speciales, P. graminis tritici × P. graminis secalis and P. graminis tritici × P. graminis agrostidi on barberry plants, and obtained new variants from the progenies. B. shensiana has been reported as an alternate host for P. striiformis f. sp. tritici (Zhao et al. 2013). In this study, B. shensiana was identified as a potential alternate host for the three forms tested. It appears that barberry may serve as a common platform for different formae speciales to hybrid if simultaneous infections occur under natural conditions. Further studies are needed to test this hypothesis. Uredinial hosts of P. striiformis are restricted in Gramineae family. The most susceptible genera include Aegilops, Agropyron, Bromus, Elymus, Hordeum, Secale, and Triticum (Stubbs 1985). Formae speciales differentiation of P. striiformis was primarily conducted based on host specialization (Eriksson 1894). The species of P. striiformis were divided into five formae speciales, namely Pst on wheat, Psh on barley, Pse on Elymus, Pss on rye, and Psa on Agropyron. Subsequently, four more forms of P. striiformis, including f. sp. dactylidis, f. sp. poae, f. sp. leymi, and f. sp. pseudo-hordei, were reported by several researchers (Manners 1960; Tollenaa 1967; Niu et al. 1991; Wellings et al. 2000). Based on host specialization of P. striiformis, f. sp. hordei, f. sp. tritici, and f. sp. poae and DNA markers, Chen et al. (1995) determined that the three forms were different from each other, but the wheat and barley forms were more related to each other than to the bluegrass form. The forma specialis level of Pst and Psh was also confirmed at the genome level (Xia et al. 2018). According to spore morphology and molecular data, Liu and Hambleton (2010) classified P. striiformis into four lineages, including P. striiformis on Triticeae, P. striiformoides on Dactylis glomerata, P. pseudostriiformis on Poa, and P. gansensis on Achnatherum inebrians. For the first lineage, P. striiformis, has the widest host range in tribe Triticeae, including Aegilops, Elymus, Hordeum, and Triticum. Wild grasses are the primary hosts for P. striiformis in the original center (Hassebrauk 1965). Rust fungi in Uredinales are speculated to experience profound changes in either morphological or biological traits a couple of million years ago (Anikster and Wahl 1979). This indicates that cereal rust pathogens, including P. striiformis, have evolved with cultivation of crops during dissemination of the rust pathogen from the original area to other regions (Stubbs 1985). Under the pressure of host selection, P. striiformis has been acquiring new pathogenicity to produce different forms on crops and wild grass species. The present study may open the opportunity to study the genetic relationships between the different forms. In the present study, we determined that barberries can serve as an alternate host for P. striiformis f. sp. agropyri on Agropyron, f. sp. elymi on Elymus, and f. sp. hordei on Hordeum based on host specialization, spore morphology, and artificial inoculation. The results showed that these forms have their own specific primary hosts and their basidiospores can infect barberry and produce pycnia and aecia. The resulted aeciospores of these forms can further infect their respective primary hosts but not wheat. Thus we showed that barberry can serve as an alternate host for these formae speciales of P. striiformis. Plants and seeds of two grass species, Agropyron cristatum (L.) Gaertn. and Elymus cylindricus (Franch.) Honda, were collected in Tianshui, Gansu Province during September to October 2013, and cultivated in greenhouse. The two grass species were identified by Zhenhai Wu, a botanical researcher at College of Life Sciences, Northwest A&F University, Yangling, Shaanxi, China (Additional file 3: Figure S3). Seeds of hulless barley cv. Guoluo (Hordeum vulgare L. var. nudum Hook) were kindly provided by Yuelin Peng at College of Plant and Pasture, Tibet University, Linzhi, Tibet, China. Young plants of barberry (Berberis shensiana Ahrendt) were transplanted from Baoji, Shaanxi Province and grown in the greenhouse to produce new leaves for later use. Seeds of A. cristatum, E. cylindricus, barley cv. Guoluo, susceptible to the barley stripe rust pathogen (P. striiformis f. sp. hordei), and wheat cv. Mingxian 169, susceptible to all known races of P. striiformis f. sp. tritici (the causal pathogen of wheat stripe rust), were grown in pots filled with commercial mixed soil (Inner Mongolia Mengfei Biotech Co. Ltd., China). Two or three-leaf old wheat and barley cv. Guoluo seedlings and 5 or 6-leaf old grass seedlings were used for spore propagation and infection tests. 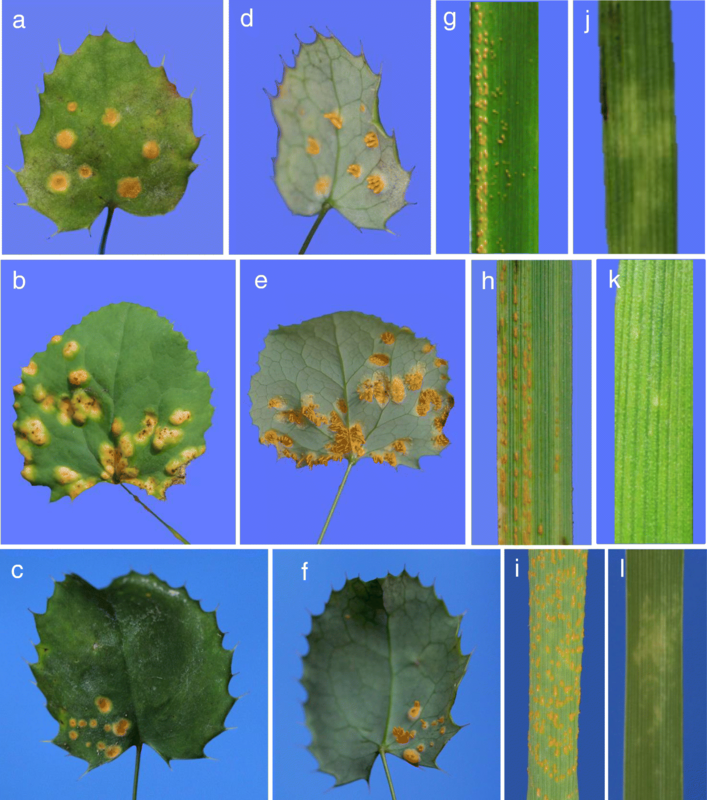 Stripe rust-infected leaf samples and plants of A. cristatum and E. cylindricus, were collected from Tianshui, Gansu in October, 2013 (Additional file 4: Figure S4). Leaf samples infected by the barley stripe rust fungus were collected in Linzhi, Tibet in June, 2013. 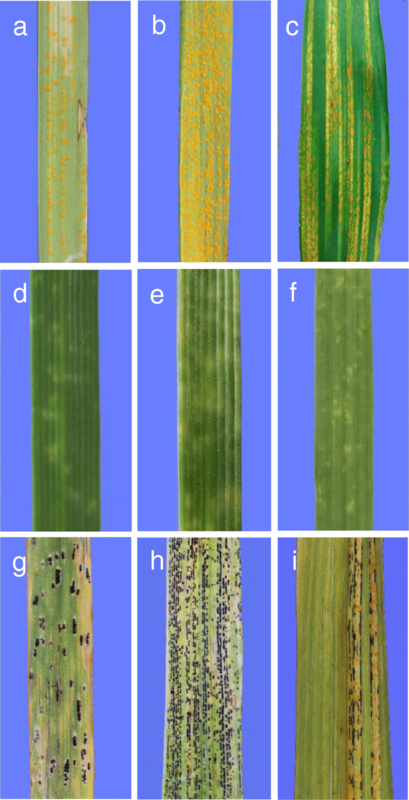 To obtain pure stripe rust isolates of each of three forms of P. striiformis, a single uredinium produced on leaves of each of the two grass species and barley cv. Guoluo was picked to inoculate new leaves of the sample grass or barley cv. Guoluo. To test host specialization, urediniospores of the single uredinium-derived isolates were inoculated on three to five leaves of each of the two grass species and barley cv. Guoluo, and wheat cv. Mingxian 169 seedlings, respectively. Simultaneously, race CYR32 of P. striiformis f. sp. tritici was used to inoculate seedlings of wheat cv. Mingxian 169 as a control in all the tests. Inoculated plants of grasses and wheat were incubated in the dark at 10 °C for 24 h in dew chamber (I-36D, Percival, U.S.A.), and then transferred to a growth chamber at 13 °C to 16 °C, and 16 h light and 8 h dark with light intensity of 8000 to 10,000 Lx. Reactions of the single uredinium isolates on grass and wheat plants were observed at 15 to 20 dpi according to a scale of 0 to 4 (Li and Shang 1989). To prepare teliospores of the stripe rust isolates on two grass species and barley cv. Guoluo, the urediniospore-infected plants were kept in a growth chamber under the same conditions as mentioned above. Leaves bearing telia were collected and kept in a desiccator for a couple of weeks to 1 month at room temperature for later use. Based on the determination of each form of P. striiformis by tests of host specialization, morphological characteristics of urediniospores and teliospores were observed using a light microscope (DP72, Olympus, Japan). Size of urediniospores and teliospores were determined by measuring approximately 100 spores using software cellSens attached by the microscope apparatus. To further determine Agropyron form and Elymus form of P. striiformis, genome DNA of urediniospores were extracted using a Biospin Fungus Genomic DNA Extraction Kit (BioFlux, Tokoyo, Japan) according to the manual operation guide. The genomic DNA were amplified with primers Rust2inv (Aime 2006) and ITS4 (White et al. 1990) in a PCR thermal cycler (Applied Biosystems, MA, USA), with P. striiformis f. sp. tritici race CYR32 as a positive control. Each of the targeted bands was cloned into a pMD-T simple vector (TaKaRa, Japan) after PCR products were electrophoresed in an agarose gel. The clones were sequenced by Yangling Tianrun Aoke Biotech Co. Ltd. Sequence alignment was performed among the two grass species forms of P. striiformis and P. striiformis f. sp. tritici race CYR32 using software DNAman (V 6.0, Lynnon). Sequences of the three forms of P. striiformis and that of the related Puccinia species retrieved from the NCBI database (https://www.ncbi.nlm.nih.gov/) were used to construct phylogenic tree for taxa. To test whether barberry can serve as the aecial hosts for the three forms of P. striiformis on the grass species and barley cv. Guoluo, leaf segments bearing teliospores were placed on 2% (w/v) water agar medium in a Petri dish and kept at 16 °C in an incubator and periodically checked for teliospore germination. As teliospores began to germinate, a transparent cylinder made with an A4 paper-sized plastic film was used to enclose the young barberry plants and the dish was inverted to cover the top of the cylinder. The barberry plants were moved into an incubator for inoculation at 16 °C and kept there for 3 days before being moved to a growth chamber. Infections of the barberry plants were observed periodically. Aeciospores were used to inoculate seedlings of wheat and grass species. The inoculated plants were incubated in a dew chamber after inoculation and then in a growth chamber under the same conditions as described above. Reactions of wheat and the three grass species were recorded at 15 to 20 dpi. The same scales as mentioned above were used to determine the pathogenicity of aeciospores. We thank Guorong Wei for providing urediniospores of race CYR32 of Puccinia striiformis f. sp. tritici used in this study. We also thank Dr. Chongjing Xia from Department of Plant Pathology, Washington State University, Pullman, US and Dr. Chunlei Tang from College of Plant Protection, Northwest A&F University, Yangling, Shaanxi, China, for English language polishing. This study was financially supported by National Key R&D Program of China (2018YFD0200500), the Natural Science Basic Research Plan in Shaanxi Province of China (2017JM3006), The Key Project of Science and Technology of Tibetan Autonomous Region, China (XZ201702NB15), the National Natural Science Foundation of China (31071641), and Program for New Century Excellent Talents in University (NCET-13-0490). Whole plants and seeds for these experiments were collected by Prof. Jie Zhao from Northwest A&F University. Fungal materials were provided by Institution of Plant Pathology, Northwest A&F University. JZ and ZK designed the experiments of the study. SH, SZ, DZ, YL, and ZD conducted experiments. SH, ZK and JZ wrote the paper. All the authors read and approved the final manuscript.